The day after backing the motions on Clinton and Keller, the State Board of Education voted to keep Moses in high school U.S. history standards. The Texas State Board of Education backed a motion Tuesday evening to reinsert Hillary Clinton into the state's 11th-grade U.S. history standards, two months after voting to remove the 2016 Democratic presidential nominee from the state's curriculum. In a separate action Tuesday, the board backed restoring disability rights advocate Helen Keller to the state's third-grade social studies curriculum standards. The action spilled over to Wednesday, when the board voted to keep Moses in high school U.S. history standards. The state board met this week to finalize the changes to social studies curriculum, part of a streamlining effort that began 10 months ago in response to teacher feedback that the standards included too much material to cover in a school year. Work groups made up of teachers, historians and curriculum experts were tasked with cutting repetitive and unnecessary requirements out of the social studies standards. The board took preliminary votes on the changes Tuesday and Wednesday and approved the new standards with a final vote Friday. A motion to remove “states’ rights” as a cause of the Civil War also failed Tuesday along party lines, drawing criticism from left-leaning state board watchdog, Texas Freedom Network. Board member Erika Beltran, D-Fort Worth, put forward the motion to reinsert Clinton into the standards, with the support of some conservative colleagues. But Beltran failed Wednesday at persuading the board to remove Moses, a move she and other Democrats said would make the standards more accurate. “Governor Abbott and the Supreme Court are not our founding fathers,” Beltran retorted, arguing no proof exists that founding fathers were influenced by Moses. After hours of public testimony Tuesday, the board approved amendments restoring references to Keller and the importance of Women Airforce Service Pilots, or WASP, in World War II. 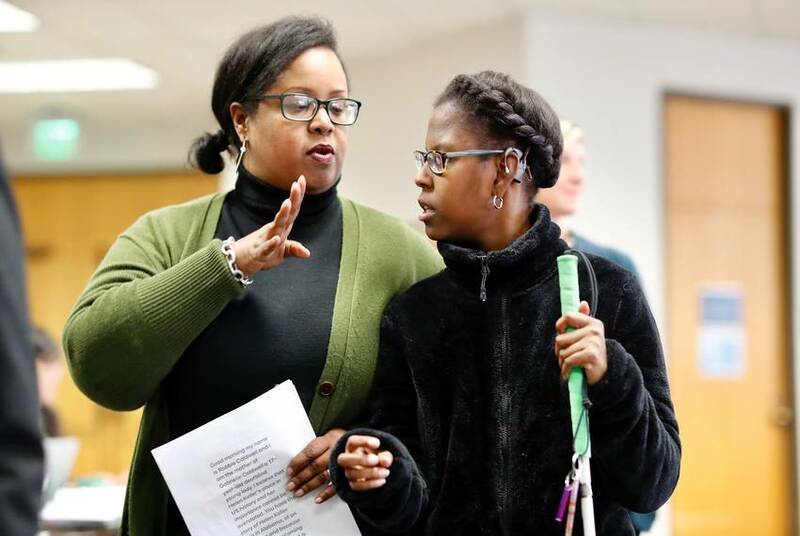 Gabrielle Caldwell, a 17-year-old deaf-blind student, testified before the board with her mother, Robbie, urging board members to reconsider striking Helen Keller’s name from the standards. 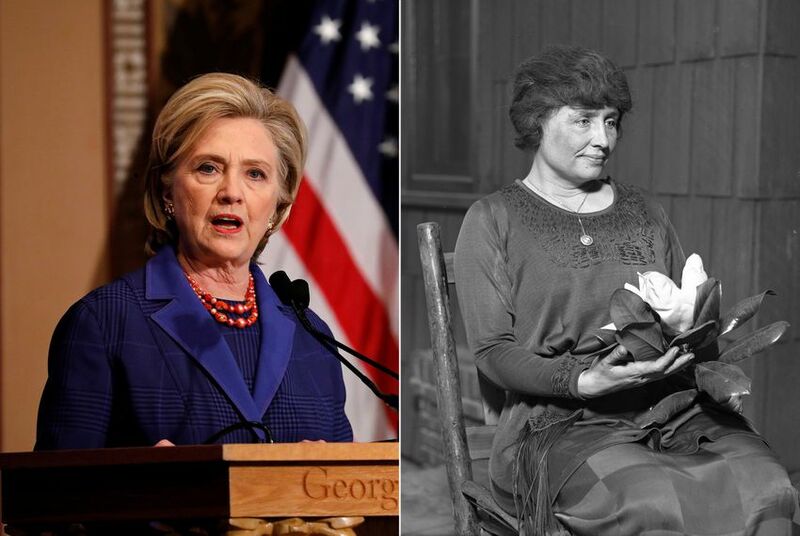 “Without broad academic knowledge of Helen Keller, deaf-blind students like my daughter cease to exist,” said Robbie Caldwell, a member of the Deaf-Blind Multihandicapped Association of Texas, a disability rights advocacy group for parents of disabled children. After the Caldwells’ testimony, board chair Donna Bahorich was visibly emotional as she thanked them for their presence at the board meeting. Even ahead of the vote to restore Keller to the curriculum, board members were expressing a willingness to reconsider her removal. Jane O’Brien, who described herself as the parent of a child with a learning difference, called Keller “an important reminder for teachers to not underestimate their students.” Texas has a problematic history with regard to disability rights, said O’Brien, referencing the state’s current legal battle with the U.S. Department of Education for decreasing special education funding. “People forget about it,” said Paul Daley, whose daughter is deaf-blind and nonverbal and is also a member of the Deaf-Blind Multihandicapped Association of Texas. He described the disability community as “the only one that you can join, any day.” He urged the board to put Keller back into the curriculum standards. “Her story makes my own life a little bit easier,” Daley said. Defenders of the cuts to the policy have stressed that removing important historical figures from the state’s requirements did not prevent individual schools from teaching them. The board also heard testimony Tuesday on how the state's high school curriculum currently handles the Israel-Palestine conflict, which includes asking students to “explain how Arab rejection of the State of Israel has led to ongoing conflict.” After critics argued that the language inaccurately placed the onus of the conflict exclusively on Palestinians, the board approved an alternative from member Tom Maynard, R-Florence: “Discuss factors contributing to the Arab-Israeli conflict, including the rejection of the existence of the state of Israel by the Arab League and a majority of Arab nations.” But it wasn’t good enough for Georgina Pérez, D-El Paso, who exclaimed, “Oh God, no, this is horrible,” as the motion passed. The updated curriculum will go into effect for eighth through 12th grade next fall. Implementation for kindergarten through seventh grade will be delayed until 2020. Aliyya Swaby contributed to this report.